For over 300 years, this scene set by Dutch painter Hendrick van Anthonissen appeared to be nothing more than a depiction of a day at the beach. But just a few layers of paint deeper, it had a secret: A giant portrait of a beached whale. Shan Kuang, a grad student at the Hamilton Kerr Institute, was removing a layer of varnish from the painting as part of a routine cleaning when she was surprised to see what looked like the silhouette of a giant fin rising out from the middle of the sea. As conservators continued to strip away layers and layers of paint, the figure was revealed to be much, much larger, stretching out of the sea and into the sand. It was, unmistakably, a beached whale. So what is the whale doing there and why was it hidden in the first place? Intriguingly, Anthonissen left every other aspect of the painting — including the crowd of on-lookers surrounding the whale — exactly as is. 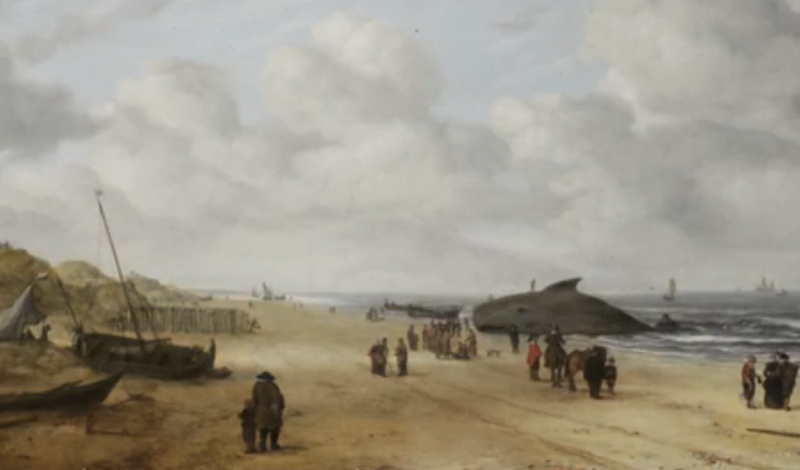 Only the whale itself was disappeared, a decision that may have been the result of a compromise between the artist's vision and 17th century social mores. "Over the centuries," says Kuang, "the attitude towards painting has changed. In the past it would be very common to cut a painting or to paint over it to fit aesthetic purposes."